MANILA, Philippines — There was no meddling from Malacañang in the awarding of the controversial P15.7-billion contract for the purchase of two frigates from South Korean shipbuilding giant Hyundai Heavy Industries (HHI), the President’s special assistant as well as defense and Navy officials told a Senate inquiry yesterday. The inquiry, conducted by the Senate committee on national defense and security chaired by Sen. Gregorio Honasan, was investigating allegations that Special Assistant to the President Christopher “Bong” Go intervened to favor a supplier of a combat management system (CMS) for the two frigates. Go denied any wrongdoing and read a statement critical of the media, calling it “fake news.” He said he was simply passing on to the defense department a “complaint” the Office of the President had received. The Philippine Daily Inquirer newspaper and news site Rappler last month carried leaked copies of a white paper originating from the President’s office and asking the Navy to look at a proposal by a South Korean subcontractor, Hanwha Land Systems, to supply the weapons system. Vice Adm. Ronald Joseph Mercado, who was sacked last December for allegedly blocking the Frigate Acquisition Project (FAP) and insisting on another CMS supplier, said Go did not intervene in the frigate acquisition project. “Let me reiterate as regards to the January 2017 letter, Secretary Bong Go never approached me to inquire about the frigate acquisition project, neither did he make any form of communication to influence my decision-making as the end user and as the flag-officer-in-command of the Philippine Navy,” Mercado told the hearing. The former Navy chief was referring to some documents sent to him that had a post-it note attached by Defense Secretary Delfin Lorenzana on Jan. 12 last year instructing him to respond to Go’s queries on the deal. Lorenzana said he could not recall who handed him the documents except that they were part of a stack of official papers given to him when he was at Malacañang, and he disposed of them promptly when he reached his office at Camp Aguinaldo. “I totally forgot about that until I read the papers,” Lorenzana told the committee. Under the FAP contract signed last October, HHI has the final say on which CMS brand to install on the vessels. It had opted to use Naval Shield, a CMS made by a South Korean firm, Hanwa Systems. A CMS coordinates the simultaneous use of a ship’s multiple armaments in an attack. Mercado, his successor, Rear Adm. Robert Empedrad, as well as other Navy officers were in favor of another CMS – Tacticos – made by Thales, a French multinational firm. Lorenzana stressed that the Navy itself said both Tacticos and Naval Shield meet the specifications of the FAP. He said HHI is willing to use Tacticos except that it would mean an additional $14 million or a total of P700 million added on to the FAP cost. Go strongly denied having tried to influence the deal to favor Hanwa Systems, even as he reiterated his challenge to resign if any official would testify otherwise. He said Rappler and Inquirer “maliciously” interpreted Lorenzana’s post-it note. “We are being castigated for endorsing a complaint to the proper agency, a mere routinary endorsement which is one of the thousands of complaints we endorse as part of President Duterte’s agenda to open up the gates and ears of Malacañang to all complaints against public officials and against the bureaucracy,” Go told the hearing. “This controversy is seriously derailing the implementation of this security measure. Perhaps, this is really their intention? To block the implementation of this important security program? And ensure that this administration will fail? But we will not allow them to win because the truth is on our side,” Go said. Lloyd Christopher Lao, a former undersecretary of Go, testified the query for Mercado originated from him after some Koreans complained to him about the CMS issue. Lao said he called for a meeting with Empedrad, who was head of the FAP technical working group; Commodore Sean Anthony Villa, former project management team leader, on Jan. 18, 2017, or several days after Lorenzana sent his note to Mercado, to answer the unidentified Koreans’ complaint. Empedrad, Villa and some other Navy officials gave a briefing on the CMS and recommended the use of Tacticos. A few days later, Empedrad sent a letter, through Go, making the same recommendation. The Navy officials present during the meeting told the hearing that Lao did not give any indication that Go was pushing for another CMS supplier. Sen. Joseph Victor Ejercito said the controversy is just an issue between Lorenzana and Mercado and had nothing to do with Go. “It’s really political. He was implicated here with the aim to implicate the President,” Ejercito said. Many of Go’s supporters who rallied outside the Senate said that only Mercado could have provided Rappler and the Inquirer the letter, as he had an ax to grind against the administration over his getting dismissed and his not getting his wish for HHI to choose Tacticos’ CMS over Hanwha’s. “It’s hard to answer issues that you’re not part of,” Go said. Presidential spokesman Harry Roque said the contract, which was negotiated during the previous Aquino administration, underwent scrutiny by the defense department under the present administration. “The conscience of the Duterte administration is very clean,” Roque said on radio ahead of the hearing. “We implemented, we followed the law, but it was not this administration which chose the supplier,” he said. “But perhaps tomorrow (Feb. 20), I will get the documentary evidence that his interest in Tacticos goes beyond the reputation of Tacticos, that he has actually made several trips to the corporate headquarters… And of course, we don’t know why he made these trips to the Tacticos’ office,” he added. “Let us not use our office in government to spread things that are not true,” he said. “His (Go) main wish is to serve the President and this country. I think financially, he is very comfortable, coming from a very wealthy background himself. He has no desire to amass material wealth,” Roque said. “And in the few months that I have worked with him very closely, what I do know is that he is absolutely loyal to this President. And he is also fearful of this President so he will not try anything,” he added. Sen. Antonio Trillanes IV, one of Duterte’s critics, believed Go would not do anything without Duterte’s order. “If it is established that he was involved, then it is not because Bong Go had an interest in it, but rather Duterte had an interest in it,” Trillanes said. Cabinet officials came in full force while hundreds of people in red shirts staged a rally in support of Go. “The truth was revealed at the conclusion of this Senate hearing. I have been vindicated,” Go told reporters after the five-hour hearing. He will no longer be invited to the next hearing upon the motion of Sen. Juan Miguel Zubiri, who vouched for the integrity of Duterte’s trusted aide. Zubiri said he has known Go since his days as congressman and when the latter was working as the staff of Duterte, then also a member of the House of Representatives. “Not once did they hear Secretary Bong Go doing anything wrong. Each time they would ask assistance from him to facilitate so they won’t encounter red tape, never did Secretary Bong Go ask for bribes, fixer’s fee or a percentage in the business,” Zubiri said. “He just did his job judiciously, religiously, and he did it well. So all these coming out, I agree, is fake news,” he added. The senator jested Go does not want to be in the limelight except when he is singing. 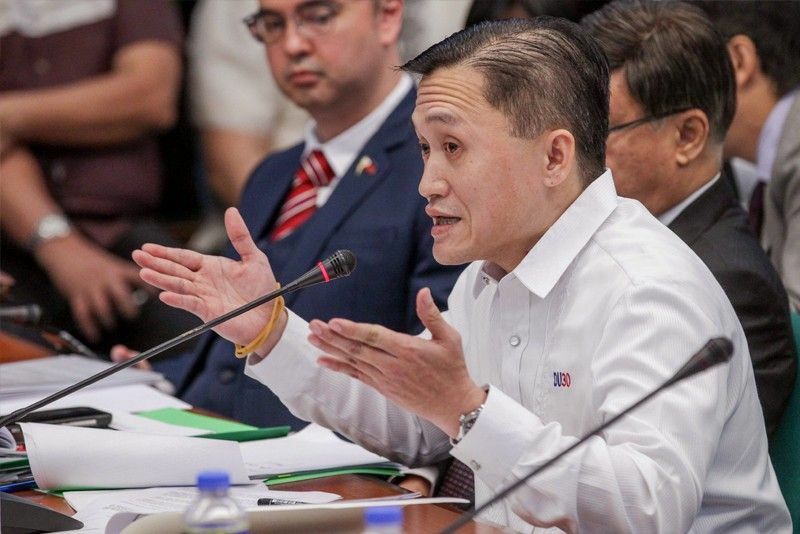 Sen. Richard Gordon said there was no point in grilling Go about the FAP as the document purportedly linking him to the deal was merely a post-it note from Lorenzana. Sen. Grace Poe cited the attendance of the Cabinet officials as an indication of their trust in Go. “This the first time I’ve seen so many Cabinet secretaries present. I believe many believe in your integrity,” Poe told Go. Sen. Loren Legarda said it was a waste of time questioning Go when the government must focus on the various security and environmental threats.